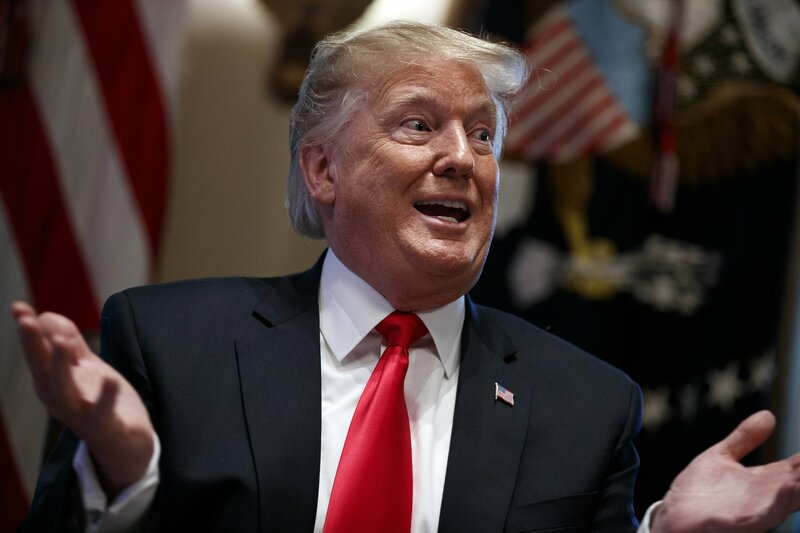 WASHINGTON — President Donald Trump is, at once, demanding billions of dollars from the U.S. Treasury for a border wall and insisting the wall won’t really cost America anything. As he’s done before, Trump argued Wednesday that Mexico is footing the bill thanks to a revised trade agreement. That’s not true. If the wall is to be built, the money will need to come from Washington’s coffers and be approved by Congress. There is no mechanism in the trade agreement or anywhere else for Mexico to pay back the U.S. or for the money to be refunded to the Treasury. TRUMP, on the number of immigrants living in the U.S. illegally: “I used to hear 11 million all the time. It would always stay right at 11. I said, ‘Does it ever increase or go down?’ ‘No, it’s 11.’ Nobody knows. It’s probably 30, 35 million people. They would flow in, mostly from the southern border, they’d come in and nobody would talk about it, nobody would do anything about it.” — Cabinet meeting. TRUMP: “The coyotes are using children to gain access into this country. They’re using these children. They’re not with families. They’re using the children. They’re taking the children. And then they dispose of the children after they’re done. This has been going on for years. This isn’t unique to us. But we want to stop it.” — Cabinet meeting. TRUMP: “I think you’re going to see a tremendous reduction in drug prices.” — Cabinet meeting. “In the first two days of January, prices have increased on more than 250 different products,” said Michael Rea, CEO of Rx Savings Solutions. The average increase is about 6 percent, he added. TRUMP, on Jim Mattis: “I wish him well. I hope he does well. But, as you know, President (Barack) Obama fired him and essentially so did I. I want results.” — Cabinet meeting. THE FACTS: Actually, Mattis resigned as defense secretary in protest over Trump’s decision to pull U.S. troops from Syria. The retired Marine general announced on Dec. 20 in a resignation letter that he was stepping down after Trump’s decision to withdraw 2,000 U.S. troops from Syria. Mattis said he would stay on the job until the end of February. Three days later, Trump abruptly said he was replacing Mattis with the second-ranking defense official, Pat Shanahan, on Jan. 1. TRUMP: “Mexico is paying for the Wall through the new USMCA Trade Deal. Much of the Wall has already been fully renovated or built. We have done a lot of work. $5.6 Billion Dollars that House has approved is very little in comparison to the benefits of National Security. Quick payback!” — tweet. There is no credible way for Trump to forecast additional growth covering costs that are being charged to U.S. taxpayers if the wall is built. Trade balances depend on too many factors — consumer tastes, exchange rates, overall economic performance and the choices of thousands of companies, for example — and some are well outside any government’s control. Trump specifically promised in his 2016 campaign that Mexico would pay for the wall. It is not doing so. Trump’s case is also built on a mischaracterization of trade balances. Unlike economists and governments, he considers a trade deficit to be a payment to the exporting country. By that argument, if a trade deficit shrinks, the U.S. is saving money. But that’s not how trade works. Consumers create a trade deficit by buying products made abroad. They get value for their purchase — the products — and are not giving money away. Trump’s claim that much of the “Wall has already been fully renovated or built” is only supported when counting work done by past administrations and ignoring the fact that fences are not the towering walls he promised. The 2006 Secure Fence Act has resulted in about 650 miles (1,050 kilometers) of border barrier. Money approved by Congress in March 2018 is to pay for 84 miles (135 km), but that work is not done. Trump’s point that the national security benefits would outweigh the economic cost is a legitimate one to debate. But the notion that U.S. taxpayers would not be covering the cost is baseless.